Occupy Wall Street put inequality at the center of our politics. Only an independent movement will keep it there. But extreme inequality has been growing for years—indeed, working people have been losing ground for more than three decades. Moreover, bad times come and go, while poverty has been with us forever. So why has populism become the coin of the political realm now? Surely, it is Occupy Wall Street—the brazen movement that briefly occupied city squares across the country in 2011—that helped to turn inequality from an accepted condition into a political issue. Occupy was scorned for not having a platform; its organizers were dismissed as idealistic anarchists; and its time in the sun was brief. But its message—“We are the 99 percent”—and its indictment of Wall Street and the greed of the 1 percent were electric. Occupy transformed the national debate and gave Americans a new way of looking at things. The media began reporting on “the new inequality,” and Barack Obama borrowed the message for his re-election campaign. The limits of the old debate were shattered. America’s two parties, we are told, are more polarized than ever. Yet the choices they offer are remarkably constricted. A suffocating bipartisan consensus cloaks the defining elements of our political economy: a national-security state that polices the world; global trade and tax policies that protect the interests of multinational banks and corporations; Wall Street greed and the financialization of the economy; the slow erosion of public capacity and investment; our remarkably stingy shared security, from healthcare to retirement; the purblind poisoning of the planet. Both parties accept the basic ways that the deck is stacked to favor the few. The consensus undergirding these policies has survived military defeat and financial debacle. The two parties wage furious debates about the color of the frosting, but the cake is already baked. Only independent citizens’ movements have any chance of disrupting the kitchen. The great changes in America have been ratified—not won—at the ballot box. They’ve been won by citizens’ movements that arise outside the national consensus. The Nation was founded by abolitionists who challenged a political order on the continuing shame of slavery. A populist movement was necessary to take on the robber barons and limit the exploitation by the emerging industrial order at the end of the nineteenth century. The civilizing movements of our own time—civil rights, women’s rights, environmentalism, gay liberation, the antiwar movement, immigrants’ rights—transformed injustices that were enforced by both parties. Movements challenge what is considered morally acceptable; they offer new ways of seeing the world around us. When they’re successful, their concerns are co-opted by smart, ambitious political leaders. The Republican progressive Teddy Roosevelt took much of his agenda from the Populist movement and party. Workers’ movements drove FDR’s New Deal. The antiwar movement forced leaders in both parties to understand that the calamity in Vietnam could not be sustained. Before George W. Bush launched the Iraq War, record protests took place across the globe. The New York Times hailed the rise of a new “superpower”: world public opinion. Bush got bipartisan support for war in any case. But Obama’s early opposition to it turbocharged his challenge to Hillary Clinton, who had voted in favor of the war to ensure her future political viability. In the Barack Obama years, the issues that have gained traction have been those driven by movements willing to challenge the president and both parties: gays and lesbians, the Dreamers, now #BlackLivesMatter and the post-Ferguson demonstrations. But independent democratic movements are rare and always face forbidding odds. They are grounded in a moral indictment of what is socially accepted: workers no longer willing to tolerate the “dark Satanic mills”; black people unwilling to accept segregation; women objecting to their own separate sphere. All of the forces of ordered opinion—government, media, church, the conventional wisdom, the mainstream political parties—are arrayed to scorn their claims and marginalize their efforts. These movements succeed only if they find ways to enlist ordinary people: to make them aware, to deepen their understanding, and to give them enough hope to act—often at great risk to themselves. Occupy put the nequality issue at the center of our politics. The question now is whether an independent movement will grow to drive it forward, challenging the conventional wisdom of both parties. Goodwyn argues that democratic movements go through four stages: 1) the creation of an independent institution that can offer a new interpretation of reality; 2) the development of tactical means to attract people; 3) broad education of the citizenry; and 4) the formation of a political vehicle for driving the new ideas into the political debate. Occupy broke through with a new interpretation of the reality around us. The “new inequality” isn’t an act of nature. It didn’t just happen; nor is it due to globalization and technology. The few are cleaning up because they have systematically rigged the rules to favor themselves. We aren’t suffering the aches and pains of bad times; we are getting mugged. Occupy’s tactical means—asserting a grassroots control of public space—spread like wildfire across the country, but it couldn’t be sustained. 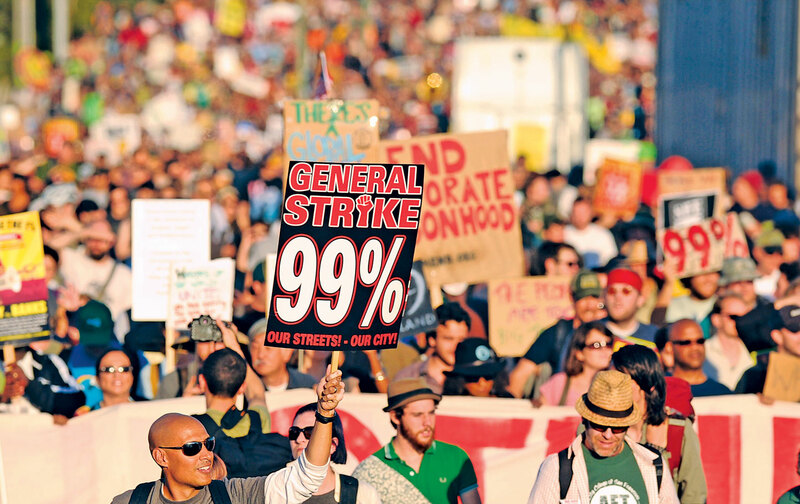 For a short time, Occupy did galvanize attention—and inspired millions. But the central challenge of a movement—an independent institution that can attract large numbers of people and broadly educate them—remains unfulfilled. Movements must do more than merely shatter the cultural acceptance of a particular injustice as “normal” or “natural”; they must also propose bold alternatives that offer a way out. And they must engage their activists and the broader public in a battle of ideas with the defenders of the status quo. Today, politicians dress old ideas in populist garb. Jeb Bush decries inequality but prescribes the same old quack remedies that conservatives have peddled for years. Barack Obama offers a range of popular reforms, but also stumps for extending the corporate trade and tax strategies that have devastated working people. As awareness grows, movements must offer a real hope that things can change. Joining a movement often entails facing mockery, scorn and ostracism as well as taking great risks. Few people are ready to make pointless sacrifices, to beat their heads against unmoving walls. Movements must offer more than solidarity; they must offer the hope that the time for change has come. This requires a vehicle, an organizational form that sustains change, and a strategy for capturing attention. The populists of the 1880s formed cooperatives that offered some relief from the grip of the big banks. From there, they dispatched 40,000 lecturers to educate farmers and workers in small gatherings across the country about banks and monetary policy. That turned into a broad movement demanding fundamental reforms, and then into a populist political party that challenged the limits of both mainstream parties. Eventually, the Populist Party folded into the Democrats, even while influencing the platforms of all of the era’s parties. Today, Americans are much better educated than they were in the populist era. They are much more wired, connected in networks and associations. They have access to infinite information. But they also face fierce pressures in the struggle to stay afloat economically, often juggling three or four jobs, working longer hours with less security. They have little time or attention to devote to politics. What is the vehicle that will drive an independent populist movement? Unions are under assault and represent an ever smaller percentage of workers. Left parties are relics. The wealth of community organizations is focused mostly on local concerns and on service. Cooperatives and worker-controlled companies proliferate, but generally do little to challenge the current order. Occupy and the post-Ferguson #BlackLivesMatter movement suggest new forms of organizing, grounded in communities of activists linked by social media, organizing creative swarms of protest and demonstration. Online organizations like MoveOn.org and CREDO engage millions of activists not simply in fundraising and petitions, but in protests and demonstrations on the ground. They also offer vital vehicles for political education and engagement. Groups like National People’s Action seek to link local organizing with a broader political vision, direct action and increasingly independent electoral activity. If these are not yet a comprehensive answer, they may be the beginnings of one. What is clear is that the populist moment has finally arrived. Extreme inequality impoverishes our people even as it corrupts our democracy. Increasingly, it is no longer accepted as natural or inevitable. Leaders of both parties acknowledge this, but are too compromised to propose solutions commensurate with the size of our problems. Doing so will require a fierce, independent citizens’ movement prepared to confront the current order. We will win the change we need only if we succeed in building a new citizens’ movement for a new time.